There are certain times of year you do not want to conduct masonry repairs and rebuilds in Toronto, as the climate will negatively impact your final results. Depending on the weather and the type of work you need done the best time of year may vary. If you notice cracked or crumbling mortar or other signs of masonry damage we never recommend waiting when it comes to calling a professional out. At the first sign of damage you should call in an expert mason in order to identify the actual issue and create a solution before the problem has a chance to expand. If the problem is not super time sensitive and there is a better time of year to conduct repairs, a professional mason will recommend this. If the work is time sensitive weather may become less important in regards to getting it done. The least busy times of the year for masonry work tends to fall in the months of June, July, August and September. Brick suppliers are less behind during the summer months, which may allow you to get materials sooner. Although, the best time of year for conducting masonry repairs tends to be during the fall, this is when temperatures begin to cool down but the full impact of snow and rain hasn’t set in yet. Rain complicates masonry repairs and rebuilds and requires extra work and precautions, such as tarps and possibly heaters, to keep masonry repairs and rebuilds dry and at the right temperature. We work all year round but the best time for repairs are when it is sunny and dry but not too hot. The best time for masonry chimney repairs is either right after the winter comes to an end, or right before winter sets in again. The reason these two time frames are ideal is because the weather is more moderate, as in the fall the weather is starting to cool down and in the spring the weather is just starting to heat back up. The most important reason to conduct repairs before the winter months is to make sure your chimney is safe for use in the winter. Another great time to conduct chimney repairs is right after winter wraps up. Your chimney gets the most use in the winter, during which time a lot of unseen damage has a chance to build up. By conducting repairs right after winter you can fix any problems before they have a chance to expand into something bigger. Repointing a masonry structure involves removing old mortar and then filling it back in with new mortar, mixed to match the original mortar in strength and color. Once this process is complete the curing process begins. The conditions present during curing are vital to the final outcome. Repointing is not complete after the joint is tooled; instead it is only complete (and considered successful) once the curing process comes to an end. While many masonry projects do best in warmer weather, curing is actually most successful when temperatures remain between 8 and 30 degrees. If it is hot outside, curing should always be conducted in the shade and away from high, humid winds. It gets complicated though because lower temperatures are best, but rain is not ideal as you don’t want the joints to have direct contact with excess water. Masons should not work on repointing on rainy days, in fact at least 7 days of sunshine is recommended for the best results. In other words, temperatures need to remain cool but the sun should be out. Of course, we can’t control the weather so there are techniques used to create optimum conditions for curing. For instance, using a propane or kerosene heater under a tarp can help keep the area properly regulated in regards to temperature and dryness. This requires extra precaution, as you don’t want the area to become too warm as this will speed up the curing process in a bad way, and you have to look out for heat loss, which is common overnight. Turnbull Masonry provides year-round masonry repairs and rebuilds. 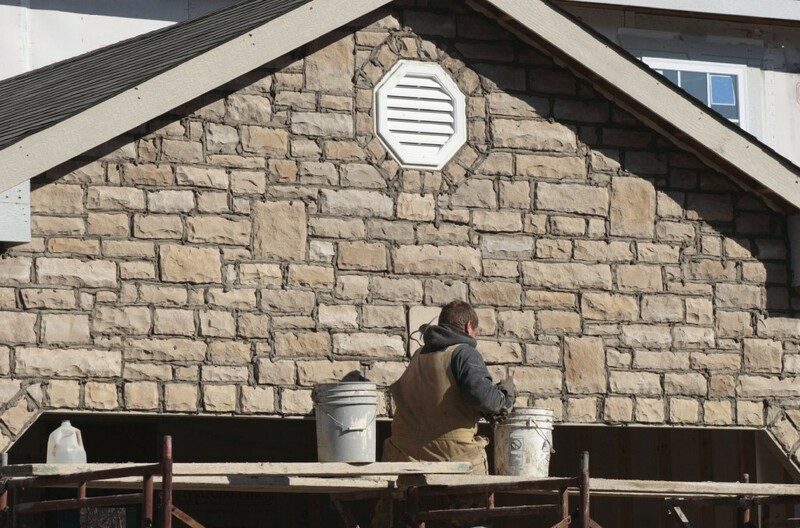 We are skilled to work around the clock in any weather, but will recommend waiting for a storm or heat wave to pass if it will impact the final outcome of your masonry work. Quality is of utmost importance to us, which is why we always take Mother Nature into consideration before starting a project. After all, the weather plays a bigger role than many often realize in the final outcome.